When Juventus signed Brazilian striker Amauri from Palermo in 2008 in a deal worth over €22 million, the feeling was that despite the fee this was going to be a great deal for them. Juventus were still struggling to recover from their forced demotion to the Serie B a few years earlier so this was a statement of intent of their willingness to spend big to return to their former glory. More than that, Amauri was an experienced player who had excelled at Palermo scoring twenty three goals in just over fifty games. He had strength, technique and a willingness to work hard; all of which hinted that a move to a big club - where theoretically he would be surrounded by better players - would elevate him to one of the finest strikers in Europe. It didn't happen that way. Amauri did reasonably well in his first year at Juventus, scoring eleven times. Those, however, came mainly in the first part of the season. From then on scoring seemed to become an alien concept for him as he flailed about in an attempt to make the transition. Nothing seemed to work and in the end Juventus had to give him away in order to get rid of him. 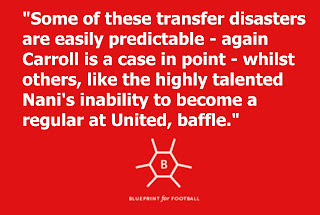 There is no top club that, in the last decade alone, hasn't gone through a similar experience. For Liverpool there was Andy Carroll, Anderson at Manchester United, Mohamed Salah at Chelsea, Roberto Soldado for Tottenham and Lukas Podolski at Arsenal. You could name whole league sides out of players who joined Real Madrid and Barcelona only to quickly find that they didn't fit. 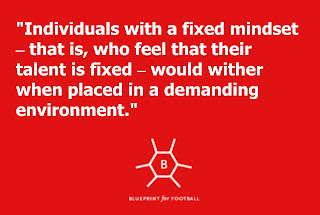 In most cases, football typically comes up with one of two explanations. The first is that the player simply wasn't good enough; that whilst he had the talent to occasionally shine for a smaller club he didn't have it in him to play on those levels on a regular basis which is what is expected when you're at a certain level. The second reason is that the new club simply wasn’t suited for him. There will always be some sympathy for Carroll at Liverpool for instance because the club’s attacking focus wasn’t based on looping balls in for him, which is where he excelled. 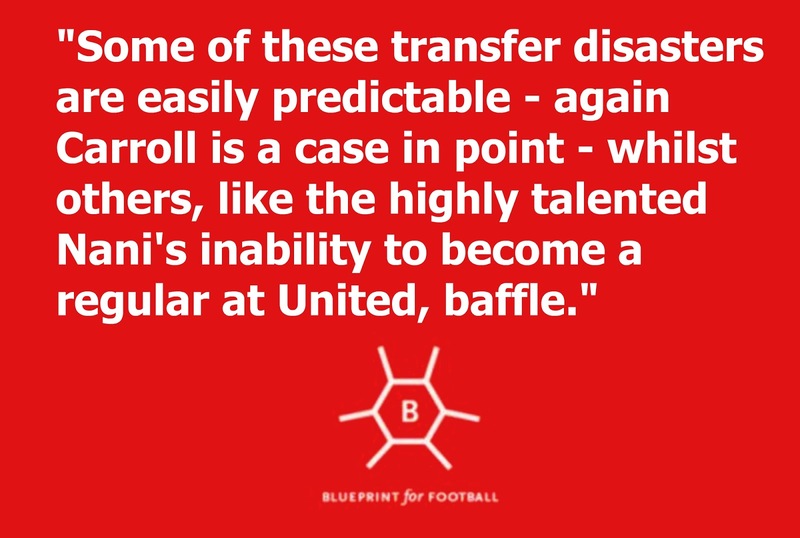 Equally, some of these transfer disasters are easily predictable - again Carroll is a case in point - whilst others, like the highly talented Nani's inability to become a regular at United, baffle. That all this happens, however, shouldn't come as too much of a shock, at least not if you look at research which has been done and which came up with the Big-Fish-Little-Pond-Syndrome. This research, which has focused overwhelmingly on academic students, found that an individual who attended a high-ability (in the sense of a school where high achievers tend to go) school had a greater possibility of lower academic self-concepts than another individual who went to a low-ability school. 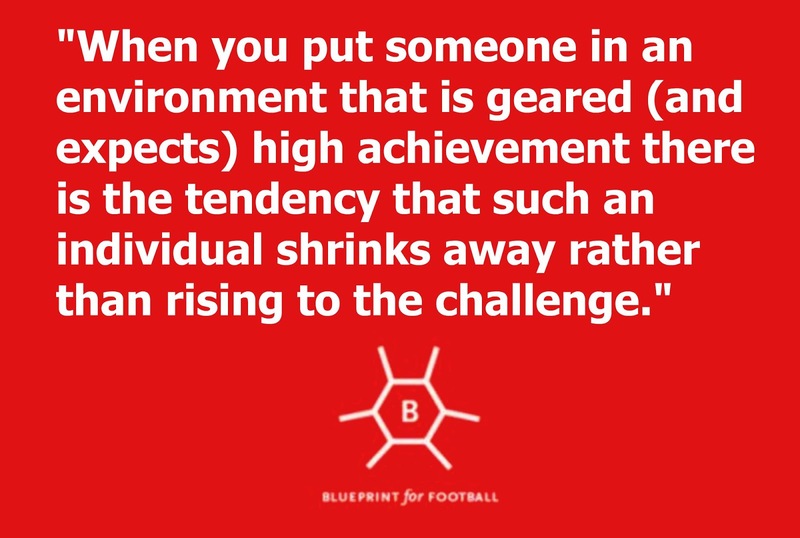 Or, to put it in another way, when you put someone in an environment that is geared (and expects) high achievement there is the tendency that such an individual shrinks away rather than rising to the challenge. They end up either failing or else coming towards the bottom of their classes. At the same time, if someone who is equally talented goes to a less demanding school but one where he can build on the confidence that he is among the better students then such an individual tends to excel. 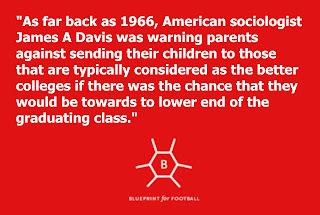 Indeed, as far back as 1966, American sociologist James A Davis was warning parents against sending their children to those that are typically considered as the better colleges if there was the chance that they would be towards to lower end of the graduating class. This, clearly, has deep implications on football. How many parents, for instance, are blinded by the glamour of the big clubs when they come calling? 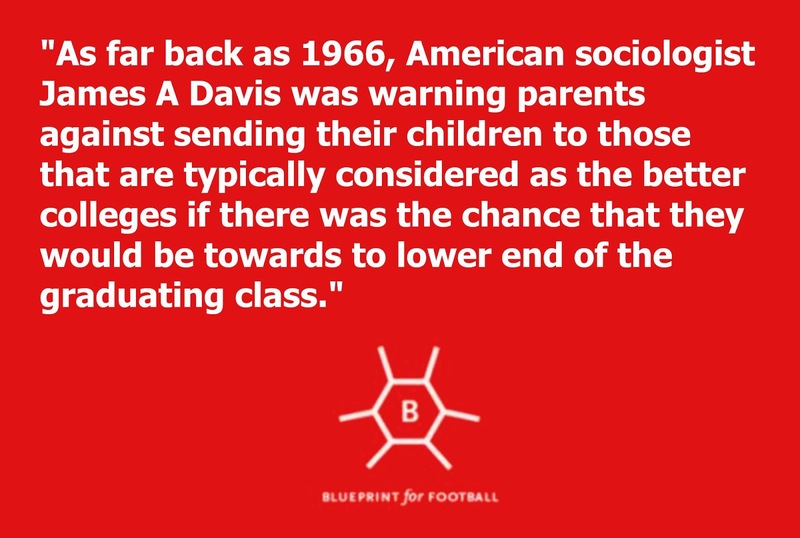 How many have uprooted promising young footballers from a smaller academy because a bigger club offered them the opportunity only to see that, rather than improve, their son actually does worse? That is not to say that such parents are willingly sabotaging their children's career. For a start, the probability of making it as a professional footballer is extremely low wherever you are playing. Also, there is the question of facilities that are available to the academies of the bigger clubs. 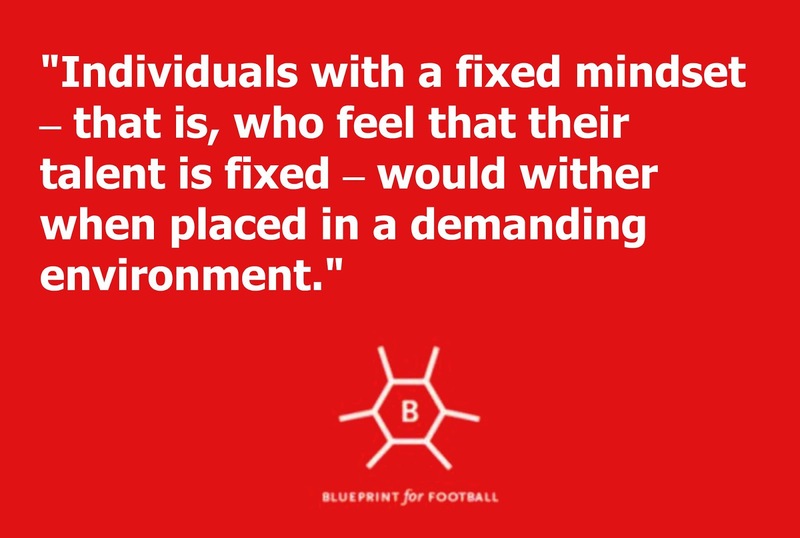 It is hard to blame a parent for thinking that their child could do better in an institution that provides him with all weather facilities, indoor pitches, an impressive array of physios and ultra-qualified coaches. Even so, if the academic research is to be transposed to football it would appear that the benefits are not as huge. There are a lot of theories as to why this happens but, often, when an individual - let alone a young teen with the changes and insecurities that age brings with it - feels that he is among the best in his team he will act in that way. He will be more willing to rely on his ability, take risks and stand out. Placed in a team where he is one of many - talent wise - there is the chance that he loses that edge. He might doubt himself and pass the ball whereas previously he might have taken a shot or beaten his man, for instance. Rather than improving, he stagnates. There are reasons for this. Mindsets, about which Carol Dweck has written and spoken extensively are probably at the forefront. 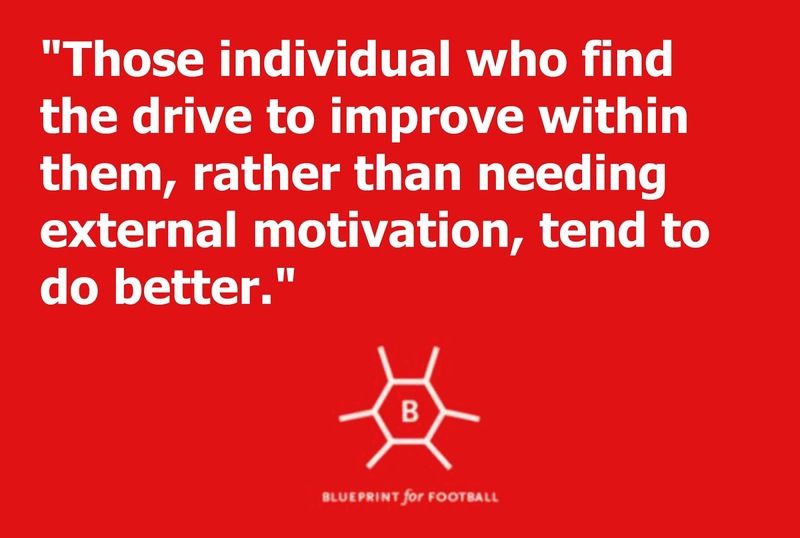 Individuals with a fixed mindset – that is, who feel that their talent is fixed and cannot improve – wither when placed in a demanding environment. There is no direct research on this, however. 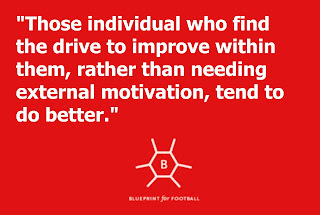 What researchers have clearly identified as a prime differentiator is intrinsic motivation: those individuals who find the drive to improve within themselves, rather than needing external motivation, tend to do better. In football terms, a player who moves to a club because he feels the pressure to accept the deal of a bigger club as others would perceive him as ‘crazy’ to pass up such an opportunity, rather than because he feels it within himself that he has to try this challenge is clearly making the move for the wrong reasons. If any proof were needed, this surely should provide people with a reason to take a step backwards and think about a move that should further their career but could ultimately kill it off. For more information on the Big Fish Small Pond effect, look up the work of Professor W. Marsh who is the main expert in this field. 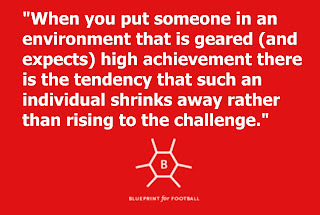 Blueprint for Football is giving away copies of Blueprint According To...Volume III, the e-book that features interviews with six coaches on their football philosophies and how these were developed. For details of how to get your copy, go here.